Light does not travel at the same speed in all directions under the effect of an electromagnetic field. Although predicted by theory, this counter-intuitive effect has for the first time been demonstrated experimentally in a gas by a French team from the Laboratoire 'Collisions Agregats Reactivite' at CNRS. The researchers measured with extreme precision, of around one billionth m/s, the difference between the light propagation speeds in one direction and in the opposite direction. These results open the way to more in-depth research aimed at improving the model that describes elementary particle interactions. 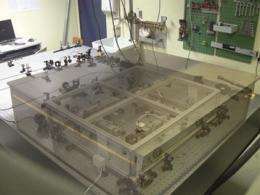 Published on the 11 May 2011 in the journal Physical Review Letters, they point to novel applications in optics. In an absolute vacuum, light travels at a constant velocity of 299,792,458 m/s. It seems natural that it should propagate at the same speed in all directions. However, counter-intuitively, there are situations in which this property is not valid, particularly when an electric field and a magnetic field are applied. Such cases were first predicted by theory in the late 1970s and should even be observed in a vacuum. However, these very slight variations are difficult to confirm experimentally. Technological progress has now made it possible to detect these effects in a gas (in this instance nitrogen). To observe them, researchers from CNRS designed an optical cavity in which the light beams pass through a device comprising magnets and electrodes, which makes it possible to generate intense electric and magnetic fields (the applied magnetic field is 20,000 times greater than that of the Earth). In this way they succeeded in demonstrating experimentally, for the first time, that light does not travel at the same speed in opposing directions in a gas where an electromagnetic field reigns. The measured difference in velocity is around one billionth m/s (i.e. 10-9 m/s, which is equivalent to 10-18 times the speed of light). This infinitesimal difference, predicted by theory, is caused by the magnetic and electric fields. These results open up several new avenues. Firstly, they could allow measurements of the anisotropy of light propagation to be pushed even further. By increasing the sensitivity of the measuring device, researchers could, one day, observe minute failures of Lorentz invariance, which is a fundamental symmetry expressed as part of the theory of relativity. This would make it possible to test certain theoretical proposals to improve the standard model (a model which today describes all of the interactions between elementary particles). Secondly, such directional anisotropy governed by an electromagnetic field could open up novel applications in optics, such as components whose behavior would differ depending on the direction, with everything being controlled by a magnetic field. We report the direct observation of the nonreciprocity of the velocity of light, induced by electric and magnetic fields. This bilinear magneto-electro-optical effect appears in crossed electric and magnetic fields perpendicular to the light wave vector, as a refractive index difference between two counterpropagating directions. Using a high finesse ring cavity, we have measured this magnetoelectric nonreciprocity in molecular nitrogen at ambient temperature and atmospheric pressure; for light polarized parallel to the magnetic field it is 2η∥exp⁡(N2)=(4.7±1)×10-23 m V-1 T-1 for λ=1064 nm, in agreement with the expected order of magnitude. Our measurement opens the way to a deeper insight into light-matter interaction beyond the electric dipole approximation. We were able to measure a nonreciprocity as small as Δn=(5±2)×10-18, which makes its observation in quantum vacuum a conceivable challenge. I will be waiting on more details on this. It might be explained by the energy of an intense EM field distorting space in the same way mass does - thereby bending the light path. As we know, light travels at different speeds in different medium and the EM field is, basically, a medium. This is a very interesting report but I don't see it impacting GR in any meaningful way. Instead, I see it as another verification that all mediums have an effect on space. We have even seen that dark matter bends light by its mass, so why wouldn't EM fields through there effective mass based on the mass-energy relationship? I always assumed that electromagnetic fields warped space-time the same as gravity does, don't they? Wouldn't that explain this? "We have even seen that dark matter bends light by its mass, so why wouldn't EM fields through there effective mass based on the mass-energy relationship?" This isn't quite the same thing . . . the light in this case isn't being bent, it's being slowed, but only in one direction. Seems to me that the importance of this experiment is in the ability to observe an effect that was too tiny to notice before, and that it verifies a theoretical prediction. I think, (it's been a long time since I looked at the theory) the presence of EM fields potentially create a miniscule but non-zero gravitational field. I could be incorrect on that proposition though. Interesting, but I truly hope this is not going to become another brick in the arsenal of the "Einstein was wrong" crowd. Not "wrong", exactly, but there has been some question regarding whether GR can be ontologically consistent AND completely reciprocal at the same time. This work shows the existence of asymmetrical reciprocity- which may be an opening large enough to assuage the philosophers. Google says that the idea that electromagnetic fields create a miniscule amount of gravity is correct. That is very interesting. Under that assumption, I think that any force carrier particle, such as a photon for example, would have gravity. However, if it is guided by E=MCsquared, by definition the mass and gravity equivalent of energe would be vanishingly small (Like hundreds of millions times smaller) compared to matter. I'm curious about this affect. The universe is full of electromagnetic fields. How would a photon be affected over cosmological scales. And since the fields are so mixed, over 5 billion light years, a distortion of 5 meters could have a signifant effect on say, a 5 meter telescope. i know that's an extreme example, but consider that when we look at a galaxy, 2 photons from opposite sides of the galaxy will encounter significantly different EM fields for part of their way to us - and it would take very little effect to impact how we see things. I always assumed that electromagnetic fields warped space-time the same as gravity does, don't they? There are some papers going in this direction, for example David Apsel's explanation of longer muon lifetime than expected in muonic atoms - by using electromagnetic time dilation. This has to be a different effect. If it was a simple warping of spacetime then the light would be affected the same going in both directions. I think you're referring to a discussion at the higher end of the intellectual spectrum -- not the one represented by the Conservapedia article on relativity. If that sounds like an encouragement to read said article, I must add that I do NOT recommend it: "You'll be sorry." I think you mean 'lower end'. I notice there is no math in the philo article on physics. Why is that? Why do philos think they can do physics with word calcs? What does philosophy have to do with physics? The discipline exhibits a great deal of inertia with no relationship to substance. It experiences significant time dilation in attempting to apply obsolete 18th century fiction to 21st century reality. It is composed of strange matter which could turn the globe into a ball of gray goo if it could propagate but there is little danger of this. It is a metamaterial cloak which luckily is transparent at all higher energy wavelengths. I guess i will be the fool to say that the light was left-handed. it simply explains that what seems paradoxical (tunnel paradox) isn't. There's nothing controversial in it at all. ..."Department of History and Philosophy of Science..."
-Philosophy of science. Philosophy_of_science. The article is inadequate for explaining the exact and intricate relationships among physical laws, with WORDS. It does give people the impression however that words can be used for this purpose and that perhaps scientists use words INSTEAD of math, when the truth is they use words as shorthand for the equations which do describe the phenomena they are discussing. It also provides philosophers, who are running short on excuses for why none of their word theories can explain anything, with something of apparent relevance to do. Words cannot explain relativity except to scientists who know the math those words represent. Period. And scientists certainly do not need number-blind philos doing their interpreting for them. OK, so did "redshift = astronomical distance" just go out the window? And before anyone hits the roof; I'm asking a question, not making a claim. This is good science but the results are not unexpected. The expirement will work in a vacume or any transparent gas. There is no need to change the direction of the light beam, just change the polarity of the magnetic and electrostatic fields to see a differance in propagation speed. Since the 1970s phase shift radar has used magnetic fields to steer microwaves to eliminate the need for a moving dish. Like all electromagnetic energy light is composed of both magnetic fields and electric currents so of course external fields will have an effect and a good example of this is the free electron laser. In an absolute vacuum, light travels at a constant velocity of 299,792,458 m/s. And again, the first sentence of the article, and allready so wrong..
Firstly, "absolute vacuum" as in "absolutely empty space" does not really exist. And secondly, if "absolute vacuum" really existed somewhere, the speed of light within would be infinite. Correct, energy content should equal gravitational potential. In the scope of this article's experiment however, this effect is mutually negated between the individual measurements (given equal field strength). There is nothing new here; any physicist knows light speed varies with index of refraction change in a material medium, and anisotrophy of light in solid & liquid materials with application of E and B fields is common knowlegde ...these idiots merely did it in a gas , NOT in a vacuum,...and light did exactly as predicted by Maxwell's eqns.....it has nothing to do with violating Lorentz invariance in a vacuum....what a deception. They must be trying to get more funding from th government.